Send us email and enjoy the holiday season with us. To really get in the spirit, check out our video of Santa Claus (RealMedia video) delivering presents Christmas night. We caught the Big Guy in 1995. We haven't caught him since. I guess you can only fool him once. The images are updated about once a minute. 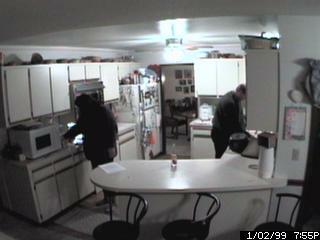 One camera is in the living room and one camera is in the kitchen. We try to leave a light on so people on the other side of the planet at least see something then they stop by. I also collect one image an hour for the last 24 hours . 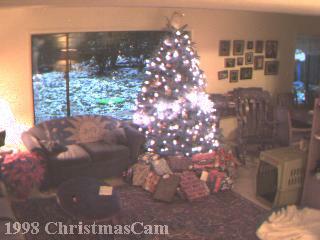 Our living room has been Christmas Cam for three previous years. You can check out ChristmasCam 1995, ChristmasCam 1996 and ChristmasCam 1997 pages. I started this web page over two years ago when cameras were new and connectivity was hard -- I was one of the first. But things have changed over the years and, today, anyone can put their home onto a web page. Companies like Connectix and software like WebCam32 makes putting your personal space on the web possible for just a few hundred dollars. The original hardware and software that makes this work description of LivingRoomCam is being replaced with a better solution. Connectix has a simple, easy to install digital camera that does not require a capture board. You won't be able to record videos or capture from another video source (like I did for our Trip Around America) but you will have a video camera for video conferencing or capturing your space. Intel Smart Video Recorder III - a video capture board for high performance, professional quality video capture. ATI has a nice line of graphic board products that incorporate video capture.